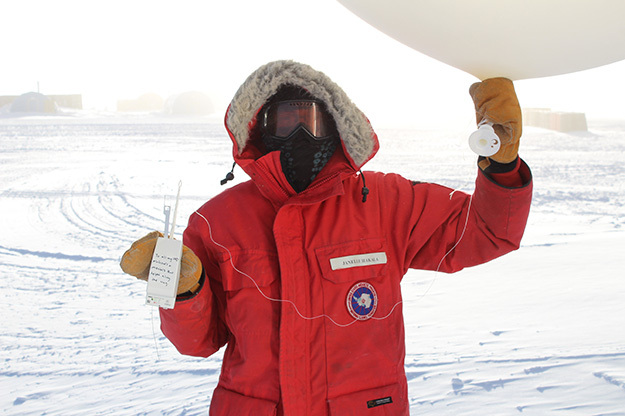 In October of 2018, before leaving the frozen continent, Janelle Hakala dedicated one of her data-gathering balloon launches to the UND professors who helped her along the way. Photo by Rob Streeter. 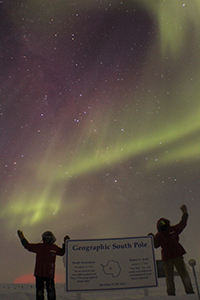 When UND Today last heard from atmospheric sciences graduate Janelle Hakala in November 2017, she was in the first weeks of a year-long stay at the geographic South Pole. She anticipated the challenges ahead: being away from friends, family and society; working in one of the coldest places on Earth. 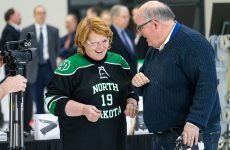 UND helped prepare her for the journey, which was on the top of her mind as she dedicated one of the hundreds of weather probes she launched throughout the year to the faculty and mentors who helped her get there. Their names now permanently occupy the frozen continent, around 21 miles from the Amundsen-Scott South Pole Station, after ascending 17 miles collecting atmospheric data. She included the faculty she had as professors, as well as a tribute to the late Leon Osborne, a UND Chester Fritz Distinguished Professor in atmospheric sciences. Chair Mike Poellet said everyone felt honored by the “amazing and creative” gesture. “It takes a special kind of person to spend a year in that part of the world,” he said. The sensor, which ascends to the edges of the atmosphere, collects essential weather measurements before returning to the surface. 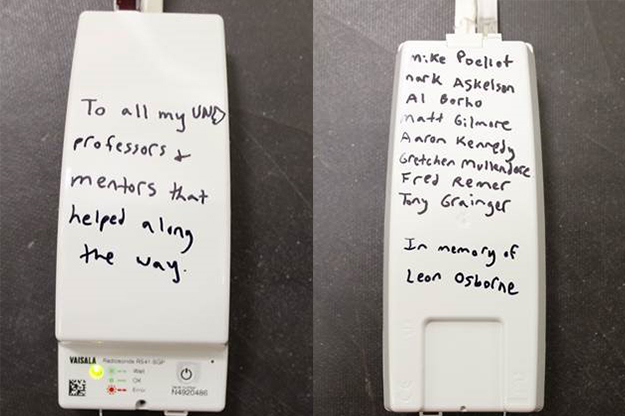 The sensors are never collected, so the names of these UND professors will remain in Antarctica. Images courtesy of Janelle Hakala. Hakala’s data collection over the past year played an essential role for the research station, as the “summer” months between November and February signify aircraft arriving with food, supplies, scientists and other support staff. The readouts from twice-daily balloon launches were utilized in an atmospheric model, which served as an aid in forecasts. These observations kept pilots and officials abreast of the latest conditions at 90 degrees south latitude. Under the southern lights. Photo by Rob Streeter. During the winter, when there’s zero sunlight and no air travel, Hakala and her team’s launches shifted to directly serve the station. Instruments crucial to the station’s research are vulnerable to wind and extreme temperatures; same goes for the maintenance equipment keeping blowing snow at bay. Living and working with the same 40 people for months on end; having big celebrations for the annual sunrise in September and the sunset in March; having little resembling a circadian rhythm; remaining physically detached from the outside world; Hakala makes it clear just how different it really was. Despite the lower amounts of activity during winter—balloon launches happened once a day instead of twice—there were plenty of ways to stay busy. Evening events were reminiscent of how colleges keep freshmen engaged on campus, Hakala said. Activities ranged from basketball to screen printing, and the diverse background of community members left nary a dull moment. The limited population during winter also meant increased responsibility for maintaining the station; Hakala found herself training to be a firefighter weekly and assisting with waste management. 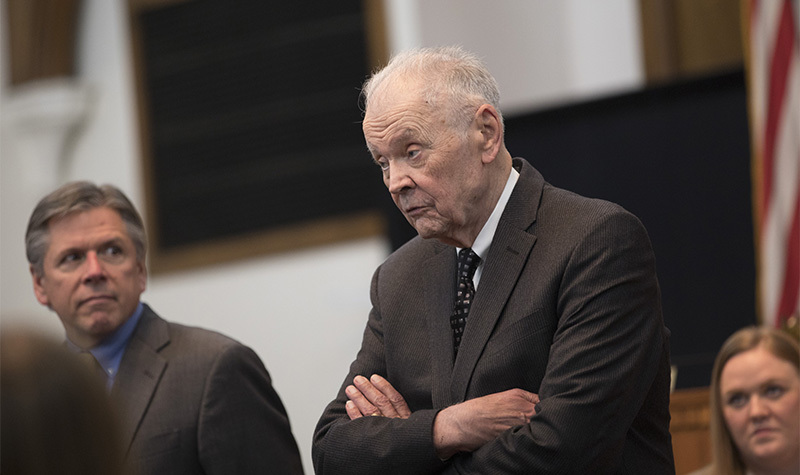 One popular use of free time was planning vacations, Hakala said. Thursday nights were “travel nights,” where people could present the places they’ve been, which proved an excellent source of inspiration. With the station positioned at 9,300 feet above sea level, hiking in Nepal sounded like a great post-Antarctic vacation. Hakala, along with friends she made over the past year, left the southern-most continent in November 2018 for their destination. 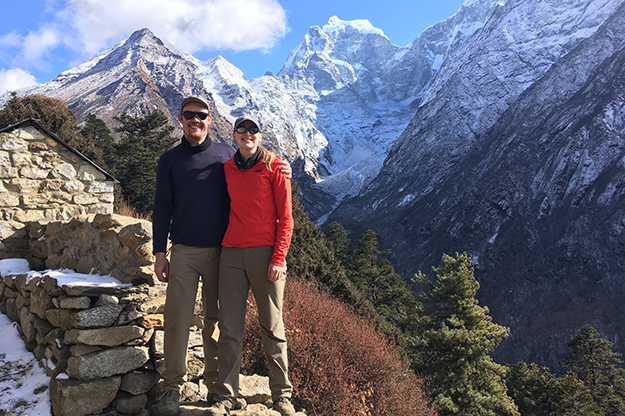 The mountain vistas and hospitality of the local guides made her journey in the Himalayas better than hoped, but it was their stop before Nepal that brought back everything she had missed while living in Antarctica. With plenty of time to plan, Hakala chose to hike in Nepal after her year in Antarctica. The conditions on the South Pole readied her and her friends for mountainous hikes and beautiful vistas. Photo by Sabeen Lama. Of the work experiences she’s had around weather sciences and meteorology, her stint in Antarctica affirmed what she’ll be looking for moving forward: something new, exploratory and scientific. 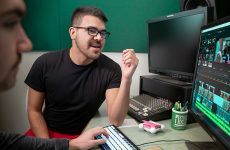 She was part of the UND Weather Update team, an intern at the National Weather Service office in Grand Forks and tried a variety of things within the atmospheric science and meteorology departments that offered her a look into different opportunities with different work. “Ultimately, they all revolve around science or weather because that’s what I love,” Hakala said.